How are prairie plants able to survive fires? The roots and growing points of prairie plants form thick networks underground, where they are protected from fire. 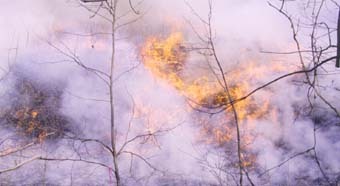 Prairie fires move quickly, so the soil acts as a buffer protecting prairie plants' underground growing structures. After prairie fires, the dark surface of the soil is warmed by the sun, and in the spring this helps seeds germinate. Existing plants grow stronger after fires. New seeds carried into the burned soil start new plants. For some plants with hard seed-coats, fire burns some of the seedcoat off the seeds and actually helps the seed germinate faster.